319 Commonwealth is located on the north side of Commonwealth, between Hereford and Massachusetts Avenue, with 317 Commonwealth to the east and 321 Commonwealth to the west. 319 Commonwealth was designed by Kirby and Lewis. architects, and built in 1878-1879, one of three contiguous houses built by building contractor Asa Harden Caton for speculative sale on land owned by wallpaper merchant Charles Henry Hayden. 319 Commonwealth was built first and completed in 1879; 321-323 Commonwealth were completed in 1880. 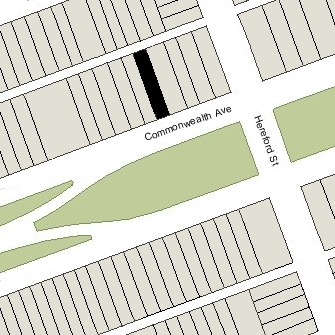 Click here for an index to the deeds for 319 Commonwealth, and click here for further information on the land on the north side of Commonwealth between Hereford and Massachusetts Avenue. The original building permit applications for 319 and 321 Commonwealth have not been located. The original permit application for 323 Commonwealth, dated March 26, 1879 (and indicating that it is for “1 in a block of 2″ houses) shows Asa Caton as the owner and the builder. Probably based on this permit application, Bainbridge Bunting’s Houses of Boston’s Back Bay indicates that Asa Caton was the original owner of all three houses. In fact, however, Charles Hayden owned the land and appears to have entered into an agreement with Asa Caton to build the houses on it. When 319 Commonwealth was completed, Charles Hayden sold the house and land to Andrew Wheelwright. When 321-323 Commonwealth were completed, Charles Hayden sold them to Asa Caton, who then resold each property on the same day he acquired it, probably thereby recovering his costs for purchasing the land from Charles Hayden and building the houses, plus a profit. The final building inspection report for 321 Commonwealth, dated October 5, 1880, shows Asa Caton as both the owner and builder (the inspection reports for 319 and 323 Commonwealth have not been located). On February 27, 1879, 319 Commonwealth was purchased from Charles Hayden by Andrew Cunningham Wheelwright, a lawyer and real estate dealer. He and his wife, Sarah (Cabot) Wheelwright, made it their home. They previously had lived at 4 Mt. Vernon. 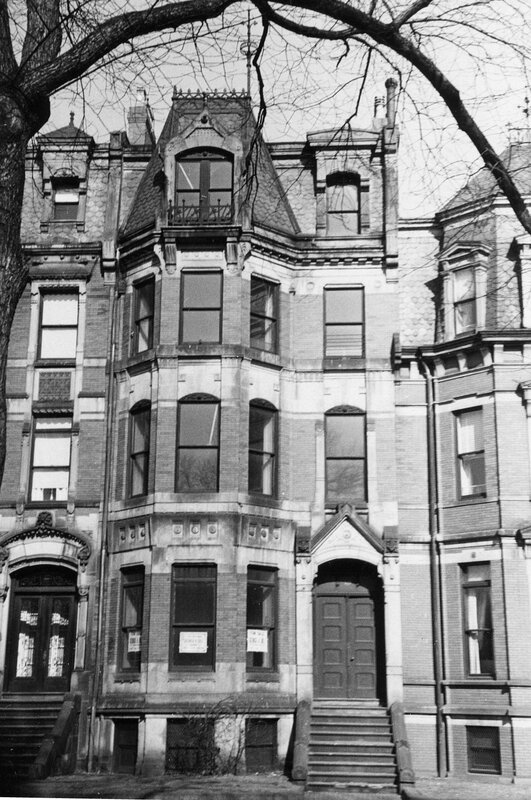 They continued to live at 319 Commonwealth during the 1884-1885 winter season, but moved thereafter to Brookline. On September 21, 1885, 319 Commonwealth was purchased from Andrew Wheelwright by printer and publisher Uriel Crocker. He was a widower and his daughter, Sarah Haskell Crocker, lived with him. They previously had lived at 29 Somerset, which was razed in connection with construction of the Suffolk County Courthouse on Pemberton Square. Uriel Crocker died in July of 1887. In his will, he left 319 Commonwealth to his daughter. Sarah Crocker continued to live at 319 Commonwealth until her death in March of 1917. On June 11, 1919, 319 Commonwealth was purchased from Sarah Crocker’s estate by William Converse Chick. He and his wife, Ruth Agnes (French) Chick, lived next door at 317 Commonwealth. By January of 1920, 319 Commonwealth was the home of Rev. William Russell Scarritt and his wife, Elizabeth (Mariner) Scarritt. Their unmarried son, William Russell Scarritt, Jr., a lawyer, and daughter, Gwendolen Scarritt, lived with them. They previously had lived at 182 Bay State Road. William Scarritt was an Episcopal clergyman, having served as co-rector of the Church of the Advent until his retirement in 1919. The Scarritts continued to live at 319 Commonwealth during the 1921-1922 winter season, but moved thereafter to 182 Commonwealth. By the 1922-1923 winter season, 319 Commonwealth was the home of Russell H. Leonard and his wife, Helen Elizabeth (Case) Leonard. They previously had lived in Fall River. They also maintained a home in Falmouth. Russell Leonard was treasurer and later president of the Pepperell Manufacturing Company, operators of textile mills. They continued to live at 319 Commonwealth during the 1932-1933 winter season, but moved to Brookline thereafter. 319 Commonwealth was not included in the 1934-1937 Blue Books and 1934-1937 Lists of Residents, and is shown as vacant in the 1934-1937 City Directories. On November 12, 1937, 319 Commonwealth was acquired from William Chick by real estate dealer Ray C. Johnson. On February 20, 1939, it was acquired from him by real estate dealers Warren-Stevens, Inc. And on February 20, 1939, it was acquired back from Warren-Stevens by William Chick. He and his wife continued to live at 317 Commonwealth. 319 Commonwealth continued to be shown as vacant in the 1938-1945 City Directories and was not listed in the 1938-1945 Lists of Residents. On February 15, 1945, 319 Commonwealth was acquired from William Chick by Harvey E. Genereux, a porter at Symphony Hall, and his wife, Priscilla E. (Charbonneaux) Genereux. They previously had lived at 76 Hampsead Road. The Genereuxs converted 319 Commonwealth into a multiple dwelling, either a lodging house or apartments. They continued to live there until about 1951, when they moved to Needham. On October 1, 1951, 319 Commonwealth was purchased from the Genereuxes by Blanche M. (Dolan) O’Connell, the wife of John Michael O’Connell, as trustee for their daughter, Claire Charlotte O’Connell. They lived in one of the apartments with their son and daughter, John, Jr., and Claire. The previously had lived at 138 Lake. They also maintained a home in Marshfield. John O’Connell was an advertising salesman with the Boston Globe. Under the terms of the trust, 319 Commonwealth became the property of Claire O’Connell on her 23rd birthday, on June 13, 1951. On July 31, 1956, Claire O’Connell transferred the property back to her mother as trustee under a new trust. The next month, she married to Andrew MacAuliffe, Jr. After their marriage, they lived in West Roxbury. John and Blanche O’Connell continued to live at 319 Commonwealth until about 1963, when they moved to West Roxbury. Their son, John, a photographer with the Boston Globe lived with them at 319 Commonwealth until the late 1950s, after which he lived in Hingham. On August 19, 1963, 319 Commonwealth was acquired from Blanche O’Connell, as trustee for Claire (O’Connell) McAuliffe, by Garland Junior College. It had acquired 321 Commonwealth in May of 1963 and had converted it into a dormitory. 319 Commonwealth appears to have been operated for one year as a dormitory for Emerson College. Thereafter, Garland Junior College occupied both 319 and 321 Commonwealth as dormitories. Glen G. Grant, trustee of the Commonwealth College Trust, purchased eleven of the twelve properties that Garland Junior College sold. On October 27, 1976, he purchased he purchased 315 and 341 Commonwealth, and 447 and 449 Marlborough; on January 4, 1977, he purchased 319, 321, 329, 337, 339, 343, and 377 Commonwealth. The twelfth property, 349 Commonwealth, had been purchased in September of 1976, by Andrew Saggese, Jr., trustee of the Drew Realty Trust. In April of 1981, the Commonwealth College Trust filed for permission to convert 319 Commonwealth from a dormitory into six apartments, which it stated was the existing use. It subsequently abandoned the application. On May 7, 1982, Judith Schwartz sold 319, 321, 337, 339, and 343 Commonwealth to Glen Grant and Mac C. Grant. On May 24, 1982, they transferred 337-339 Commonwealth to Dorothy F. Wirth, trustee of the 337-339 Commonwealth Avenue Trust, and on June 8, 1983, they transferred 319, 321, and 343 Commonwealth to her, also as trustee of the 337-339 Commonwealth Avenue Trust. 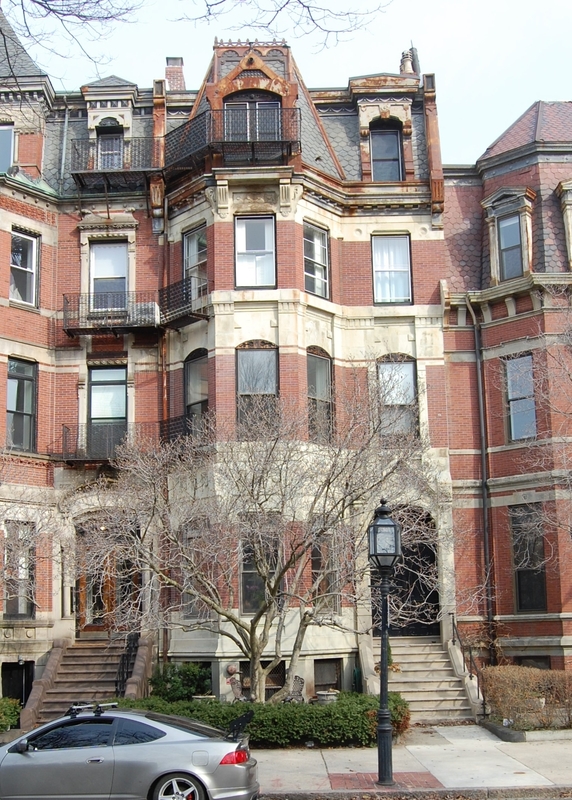 In November of 1983, the 337-339 Commonwealth Avenue Trust applied for (and subsequently received) permission to legalize the occupancy of 319 Commonwealth as six apartments. On January 5, 1984, the trust converted 319 Commonwealth into six condominium units, the 319 Commonwealth Avenue Condominium.